Cobalt Aquatics is proud to announce the arrival of the most advanced aquarium LED lighting on the market: the C-Ray 200! Cobalt Aquatics’ line of C-Ray LED light fixtures bring powerful LEDs, minimalist design, and advanced electronics together for the ultimate in aquarium light fixtures. The innovative C-Ray lights incorporate high-output chips, fill light strips, and circular halo moonlights to provide strong, evenly distributed PAR output in one full-spectrum, controllable array. 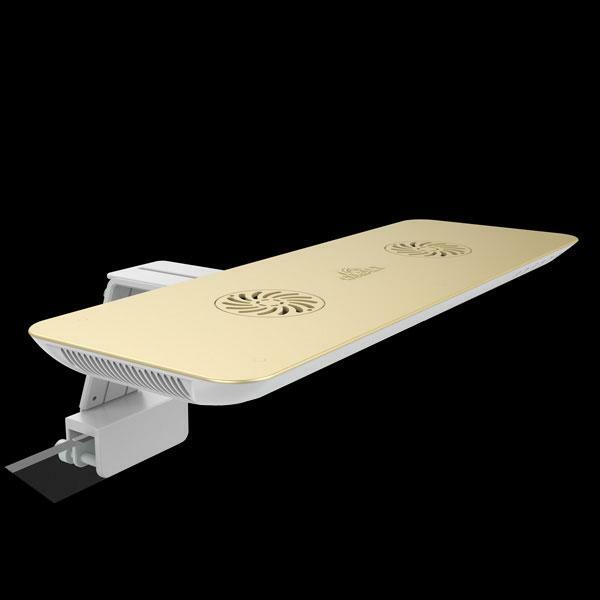 Providing up to 500 PAR at 200 watts, the C-Ray 200 can cover tanks up to 48″ long with beautiful, crisp light. Active, thermostatically-controlled adaptive fans and copper heatsinks keep the C-Ray running cooler and quieter than any other light out there. With multiple mounting options, app-driven Wi-Fi controllability out of the box, exclusive wide field quartz optical lenses, compact design, and a waterproof power adapter, the C-Ray sets a new standard for aquarium lighting, outperforming all other currently available LED lights. The C-Ray 200 is available in both black and white finishes. MSRP is $799 on the Cobalt Aquatics website.